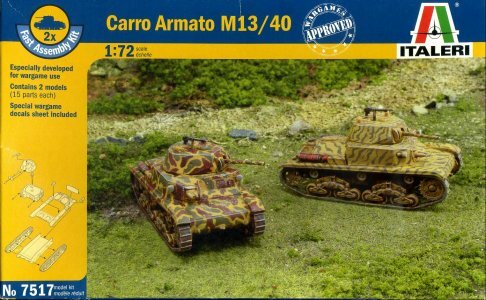 Italeri issued a new M13/40 for their Fast Assembly line. 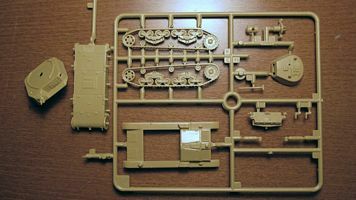 However, as reported here, Italeri did the same mistake as in kit 7036, producing yet another M14/41. 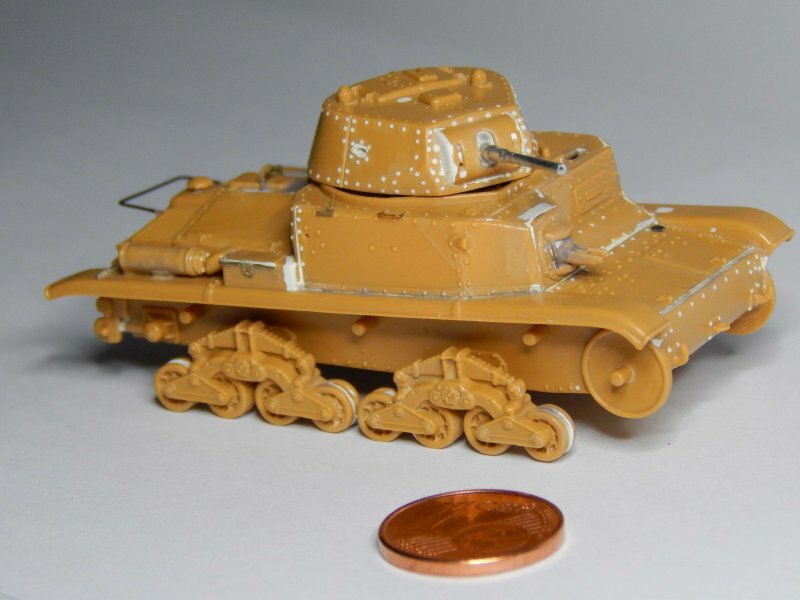 Inside, a typical fast-build kit: two sprues of sand-colored hard plastic, with some detached pieces, with a total of 15 pieces per vehicle, plus a rather interesting and comprehensive decal sheet containing tactical markings, license plates and the iconic symbol of the Ariete armored division in North Africa. 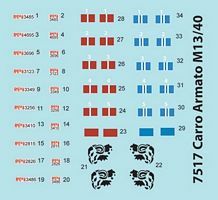 Luckily Italeri did not include the white kangaroos for the vehicles used by the Aussie forces, since only 1st or 2nd serie M13/40s were so employed. This was an unforgivable mistake made in the other kit (apart from the ridiculous mentioning of a "Royal Australian Army" in the color plates). Before blaming the kit, it is correct to say that it has some peculiar strong points over the normal, non-quick-build kit (the ex-Esci no. 7036), to the point that Italeri should be praised for having done its homework, although it took them 40 years to do it and it is not going to be given full marks anyway. 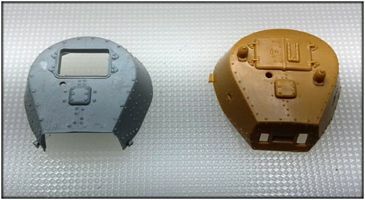 The first strong point is the turret: as reported here, the one in 7036 kit is badly mis-shaped, with the anterior "window" being too wide, with the consequence of having the gun shield too wide as well and not particularly resembling the correct shape. The turret in the present kit, on the other hand, is correct and the gun shield is rather appropriate as well. 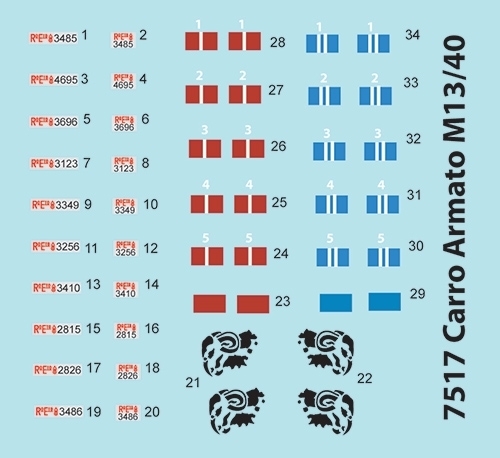 Another strong point is the crew compartment: while in the 7036 kit you have to glue the single walls risking misalignments, here you get a single piece with the relevant detail already present. 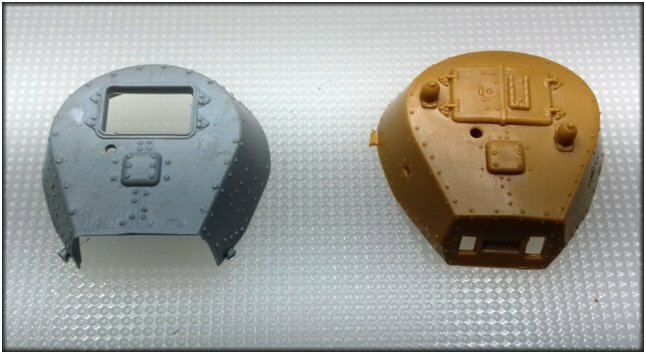 The front wall is particularly impressive, with the twin Breda hull blister complete with barrels and armored collar, and a driver's hatch which is very accurate if compared to the 7036 one (7517 on the left, 7036 on the right). Road wheels, sprockets, idlers and rollers are not that bad and rather acceptable. 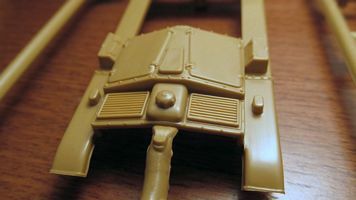 The strong points end with an engine deck and a rear plate which are rather correct (although oversimplified somehow) for an M14/41. The many weak points are obviously limitations of the slide-molding technology: the sprockets are too thick, the bogie wheels articulations are solid (but it is not much noticeable), the tracks are beyond human comprehension, every detail on the lateral sides of the turret and crew compartment is either absent (such as the bolts) or very shallow and not acceptable (the most evident one being the hull hatch). No spare wheels are present, while the jack is rudimental and is molded in-place where it should not be on an M14/41 (front left mudguard). In conclusion, obtaining a nice-looking model from this kit is not impossible, provided that you are willing to work quite hard. The absolute necessary steps: first, cut out the tracks, so that you can substitute them with aftermarket ones, and, while you are at it, cut a central slit in the sprockets, rollers and roadwheels; second, scratch a new hull hatch; then, add riveting on the sides. From now on, you can follow what already discussed here about kit 7036.